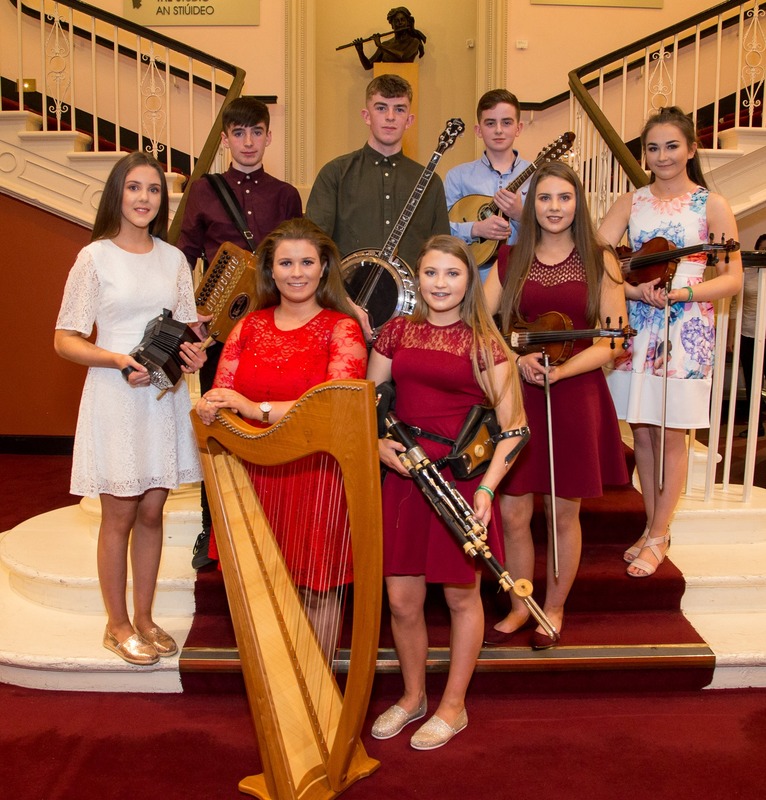 The young traditional music group ‘Lonrach’ from Laois took third place the All Ireland final of Siansa Gael Linn 2018 in the National Concert Hall on Sunday, 22 April. Siansa is a competition for young traditional Irish music and singing groups, organized annually by Gael Linn, with support from RTÉ Raidió na Gaeltachta and Irish Music Magazine, and is an important event on the calendar of young musicians. The task of adjudicating this year’s final fell to well known musicians Declan Masterson, Muireann Nic Amhlaoibh and Oisín MacDiarmada, who admitted to having difficulty choosing the winners, as any one of the eight finalists would have been worthy recipients! After a glorious evening of music and song, the group ‘Spleodar’ were awarded the top prize – the Gael Linn trophy and a cheque for €2,500- with ‘Caise’ from County Clare taking home €1,250. Third prize of €750 went to the group ‘Lonrach’ from Laois. It was a great achievement for group members, Conall Ó Cnáimhín, Ellen, Maeve and Daithí Scot, Leah Ní Mhurchú, Peadar Ó Beinéid, Fiadh Nic Giolla Phádraig and Aoife Ní Bhuachalla, who were finalists in last year’s competition also. Although they didn’t pick up a prize on the night the members of the other five groups were delighted to get the chance to perform on the National Concert Hall stage in front of an audience of almost one thousand people! Those groups included Uisneach, Coláiste na Coiribe, Galway, Fonnmhar,Bruff, Co. Limerick, Léargas, Bray, Co. Wicklow, Sin A Bhfuil, Counties Offaly and Laois, and I gCónaí Réidh, Danescastle, Co. Wexford. The concert was also broadcast live on RTÉ Raidió na Gaeltachta and Áine Hensey, one of their best known broadcasters, compered the event. Gael Linn CEO, Antoine Ó Coileáin, thanked RTÉ Raidió na Gaeltachta and Irish Music Magazine for their ongoing support for the competition and said: "With Gael Linn celebrating our 65th birthday this year we can look back with pride on our services to the cause of Irish traditional music and singing, from the first sean nós and traditional music records released in the fifties to where we are here tonight, in the National Concert Hall giving a platform to the musicians and singers of the future. Siansa uniquely ties the Irish language to our music also which enables us to promote Irish among our younger musicians and their friends and make them aware that both are naturally entwined."